Prince Aritomo Yamagata (山縣 有朋, Yamagata Aritomo) (June 14, 1838 – February 1, 1922) was a field marshal in the Imperial Japanese Army and the third and ninth Prime Minister of Japan. A general and a member of the Japanese oligarchy, he is considered one of the architects of the military and political foundations of Meiji era Japan. Following the death of Ito Hirobumi, Yamagata was unquestionably the most powerful man in Japan from 1909 until his death in 1922. Sent to Europe in 1869 by the government to research European military systems. Yamagata was strongly influenced by Prussian military and political ideas, which favored military expansion abroad and authoritarian government at home. He was instrumental in building a modern Japanese army and instituting a system of conscription, and in organizing the police force and a system of local government. Yamagata did his best to check the power of the rising political parties and to remove the bureaucracy from their control. During his second term as Prime Minister, he ruled that only an active military officer could serve as War Minister or Navy Minister, giving the military power over any future cabinet and effectively removing the military from civilian control. Yamagata Aritomo was born June 14, 1838, to a lower-ranked samurai family from Hagi, the capital of the feudal domain of Chōshū (present-day Yamaguchi prefecture), a feudal domain strongly opposed to the Tokugawa shogunate that had ruled Japan since the seventeenth century. He began his career as an errand boy for the treasury office, and an informer in the police administration. Following the opening of Japan to foreign trade by Commodore Perry in 1853, he studied from around 1858 at Shokasonjuku, a private school run by Yoshida Shōin, where he devoted his energies to the growing underground movement to overthrow the Tokugawa shogunate. He became a member of the “Sonno joi” (“Revere the emperor! Drive out the barbarians!”) movement, a group of loyalists who opposed the growth of foreign influence under the shogunate. In 1863 Yamagata was chosen commanding officer of the Kiheitai, the most famous of the irregular troop units formed by the revolutionaries in Choshu. He was wounded during the Shimonoseki Incident in 1864, during which an allied fleet of Western powers bombarded the Choshu rebels and defeated them. This defeat made Yamagata aware of the superiority of the Western military system, and convinced the leaders of the Sonno Joi Movement that their “antiforeign” policy would fail unless Japan acquired modern armament equal to that of the Western powers. In 1867 the Tokugawa shogunate was overthrown, and the Meiji government was established in 1868. When adherents of the shogunate in the north rebelled against the Meiji emperor in the Boshin War of 1868, Yamagata was appointed a staff officer and led a military operation to suppress the revolt. Through this incident he realized that the security of Japan would best be safeguarded by a system of universal obligatory military service. In 1869 Yamagata was selected by the government together with Saigō Tsugumichi to visit Europe and research European military systems. Yamagata was strongly influenced by Prussian military and political ideas, which favored military expansion abroad and authoritarian government at home. Soon after Yamagata returned to Japan in 1870, he became Secretary to the Vice Minister of Military Affairs. As a means of dismantling the system of the feudal domains and centralizing political power, he proposed the formation of an Imperial Force (Goshimpei). Early in 1871, a force of about 10,000 men drawn from the feudal armies was organized, and Yamagata was promoted to Vice Minister of Military Affairs. The Imperial Force was later renamed Imperial Guard (Konoe), and Yamagata was made its commander. Yamagata energetically modernized the fledgling army, which he modeled after the Prussian army. In 1873, with the help of the restoration hero Saigo Takamori, who wielded great influence in the army, Yamagata introduced a system of conscription. He became Minister of the Army when the government reorganized the military system into an army and a navy, and, after Saigo resigned from the government in protest of its restrained policy toward Korea, Yamagata assumed greater influence over the government. Yamagata became War Minister in 1873, but found that the right to determine government military policies lay largely in the hands of the councilor (sangi) to the Executive Council. In 1874, when a punitive expedition to Formosa was discussed, Yamagata, though Minister of the Army, had no part in the decision. This situation made him determined that military policy should be removed from civilian control. He had opposed the Formosa expedition because the Japanese Army was not yet ready for war against China; in order to allay his opposition, the government reluctantly promoted him to sangi in August 1874. In 1877, Saigo Takamori and his adherents in Satsuma rose against the government in the Satsuma Rebellion, and Yamagata led his army of conscripts against a force of approximately 40,000 samurai led by Saigo Takamori. With their modern weapons and tactics, Yamagata's army of former peasants won victory after victory, proving once and for all that the age of the samurai was over. As War Minister, Yamagata pushed through the foundation of the General Staff Office, which became the main source of Yamagata's political power and that of other military officers through the end of World War II. He was Commander of the General Staff Office in 1874-76, 1878-82, and 1884-85. In 1878 Yamagata issued an “Admonition to the Military,” countering democratic and liberal trends by emphasizing the old virtues of bravery, loyalty, and obedience to the emperor. After separating the Operations Department from the Army Ministry and reorganizing the General Staff Office, he resigned as Minister of the Army and assumed the position of Chief of the General Staff. In 1882, Yamagata induced Emperor Meiji to promulgate the “Imperial Precept for the Military” or "Imperial Rescript to Soldiers and Sailors," a recapitulation of his “Admonition to the Military,” which became the spiritual manifesto of the Japanese army and naval forces until the surrender of Japan in 1945 at the end of World War II. In anticipation of the Sino-Japanese War, he reorganized the army to adapt it for field operations. In 1882, while still Chief of the General Staff, Yamagata entered politics and became president of the Legislative Board (Sangiin), a group of elders who advised the government concerning the establishment of the basic principles of the Meiji constitution. 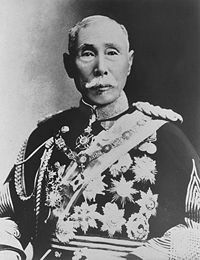 In 1883 he was appointed to the post of Lord Chancellor, the highest bureaucratic position in the government system before the Meiji Constitution of 1889. As Home Minister from 1883 to 1887, he worked energetically to weaken the power of the political parties and suppress agitation in the labor and agrarian movements. He established local government bodies based on the prefecture-county-city structure still in use in Japan, modernized the Japanese police system, and regularized controls over both institutions. He used the police force to crush the burgeoning Popular Rights Movement, ending the hopes of many that Japan might become a liberal democracy. In 1884 he was made a count and resigned as Chief of the General Staff. In 1889, after spending a year in Europe surveying systems of local government, he returned to Japan and became the first Prime Minister of Japan after the opening of the Imperial Diet (Parliament) under the Meiji Constitution. During his first term, from December 24, 1889, to May 6, 1891, the Imperial Rescript on Education was issued. More conservative than Ito Hirobumi, who drafted the Japanese constitution, Yamagata proposed to the first Diet that Japan should expand its dominion over part of the Asian continent. Yamagata, exhausted by party strife, resigned as prime minister in 1891, but served as Minister of Justice (1892–93) and president of the Privy Council (1893–94) and retained the honorific title of a member of the genrō (elder statesmen), an informal body of confidential advisers to the Emperor. In 1894, the Sino-Japanese War broke out and Yamagata was made commander of the First Army in Korea, but sickness forced him to return home in the middle of the war. In response to a diplomatic intervention by Russia, Germany and France in May, 1895, after Japan's victory over China, he negotiated a compromise with Russia in which the Korean peninsula was divided. His diplomatic mission to Moscow in 1896 produced the Yamagata-Lobanov Agreement confirming Japanese and Russian rights in Korea. In 1898 he was promoted to Field Marshal, an affirmation of his preeminent position in Japan's military and political life. Yamagata became Prime Minister for a second term from November 8, 1898, to October 19, 1900. In 1900, he ruled that only an active military officer could serve as War Minister or Navy Minister, giving the military control over any future cabinet and effectively removing the military from civilian control. He also enacted laws preventing political party members from holding key posts in the bureaucracy. Half of the members of his second Cabinet were generals and admirals, and with their support Yamagata accelerated his expansionist policy in Asia. When the Boxer Rebellion broke out in China in response to foreign encroachment, Yamagata, at Great Britain's request, dispatched the largest of the foreign contingents that were sent to put down the rebellion, heightening Japan’s reputation as an international power. In October 1900, unable to deal with a financial crisis brought on by military expansion or with the problem of the division of China by foreign powers after the Boxer Rebellion, Yamagata and his Cabinet resigned. From 1903 until 1909 he and Ito Hirobumi alternately occupied the office of president of the Privy Council. Yamagata served as the Supreme Commander of the First Army and as Chief Officer of the General Staff Office during the Russo-Japanese War of 1904–05, and for distinguished service, he was elevated to the nobility, and received the title of koshaku (prince) in 1907. After the Russo-Japanese War, in anticipation of a recurrence of conflict between Japan and Russia, he prepared a contingency plan for war with the United States and Russia. Called the Plan of National Defense for the Empire, it played a substantial part in the entry of Japan into World War II. As the military leader who traced the first lines of a national defensive strategy against Russia, he is considered political and military ideological ancestor of the Strike North Group. From 1900 to 1909, he opposed Itō Hirobumi, leader of the civilian party, and exercised influence through his protégé, Katsura Tarō. After the death of Itō Hirobumi in 1909 Yamagata became the most influential politician in Japan, supported by the military and the bureaucracy. Although he retired from active participation in politics after the Russo-Japanese War, as president of the Privy Council from 1909 to 1922, Yamagata remained the power behind the government and dictated the selection of future Prime Ministers until his death. No cabinet could be established without his personal consent. He consistently opposed the creation of a genuine Cabinet. When the Chinese revolution broke out in 1911, he attempted to help sustain the Ch'ing dynasty, and soon after the outbreak of World War I he succeeded in transforming the Japanese agreement with tsarist Russia into a military pact. Following the nationwide rice riots of 1918, Yamagata grudgingly allowed Hara Kei of the Seiyukai party to become the first Prime Minister from a political party, setting the stage for the party system known as "Taisho Democracy." Yamagata continued to be a powerful voice in Japanese politics. In 1921, however, he was publicly censured for meddling in the Crown Prince's marriage. He died February 1, at the age of eighty-four. Yamagata was a talented garden designer, and today the gardens he designed are considered masterpieces of Japanese-style gardens. An example is the garden of the villa Murin-an in Kyoto. In 1906, Yamagata received the Order of Merit from Edward VII of the United Kingdom. His Japanese decorations included the Order of the Golden Kite (1st class), Order of the Rising Sun (1st class with Paulownia Blossoms, Grand Cordon) and the Order of the Chrysanthemum. In discussing national defense policy, Yamagata characterized Korea as "A Dagger Pointed at the Heart of Japan." Jansen, Marius B. and Gilbert Rozman (eds.). Japan in Transition: From Tokugawa to Meiji. Princeton: Princeton University Press, 1986. This page was last modified on 31 July 2013, at 22:50.